This is probably one of the harder runs I’ve done, but fun nonetheless. Taking the Edmunds Trail from Mt. Clinton Rd. makes for a steep, rocky ascent. Once you reach tree line it flattens out and the footing becomes better. On the saddle between Monroe and Eisenhower is the intersection w/ the Crawford Path. 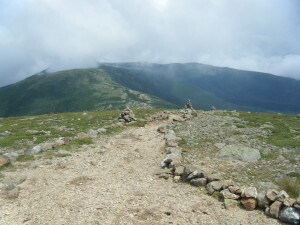 The summit of Eisenhower is fairly flat and has a giant pile for rocks. There are some pretty good views I am told. The only time I have been up there I could only see about 100m in front of me. Typical White Mountain weather. An alternate but longer route would be to take the Crawford Path from Crawford Notch. Directions: Take Rt. 302 to Crawford Notch. Once you reach the notch take a right onto Mt. Clinton Rd. Follow the road until you see the Edmunds Path trailhead on the right.